> DiJiPOP > Take control of your digital shelf space. Our turn-key "platform-as-a-service" B2B solution matches retailers' digital shelf space with manufacturers and advertiser marketing dollars and allows retailers to monetize traffic and advertisers to increase awareness at the digital point-of-purchase. 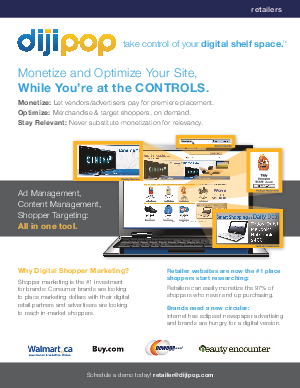 We empower both retailers, consumer brands, and advertisers to take control of their digital shelf space.